Honda Canada’s manufacturing plant in Alliston was one of the first auto assembly plants in North America to acquire ISO 14001 certification for environmental management. Recycling 99% of its production waste, no waste goes to landfill. 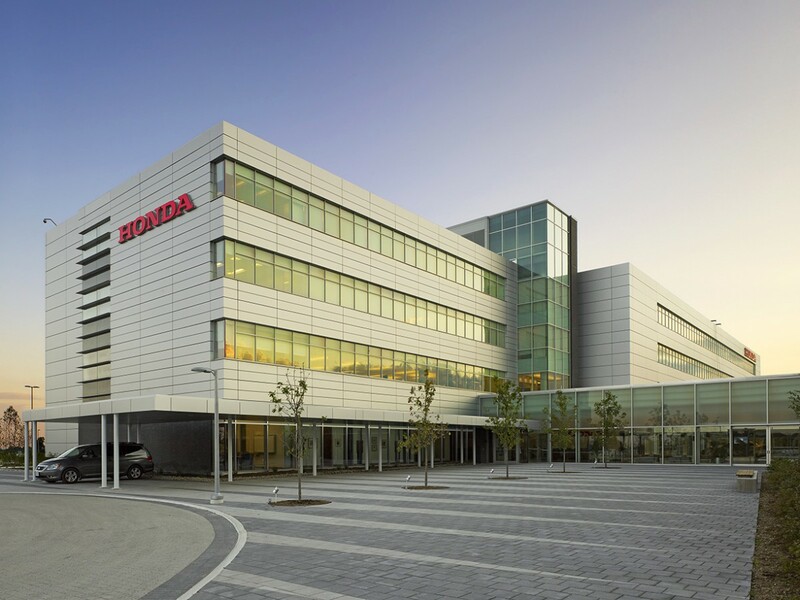 With a strong commitment to protecting and sustaining the environment, Honda developed its campus in Markham to meet strict LEED (Leadership in Energy and Environmental Design) standards. The campus, which was built in 2010, features three buildings. The first is a four-storey, 138,000-square-foot head office building, which is certified as LEED Gold. The second is a 71,000-square-foot technical centre for research and development, engineering and training, and the third is a 224,000-square-foot parts distribution centre. Innovations to support environmental sustainability can be seen throughout the campus. Over fifty per cent of the wood used in construction came from sustainable sources. Buildings were situated to improve energy consumption by using less heat in the winter and less air conditioning in the summer. Heating comes from beneath a raised floor allowing for efficiency and reduced consumption. Interior lighting adjusts based on the amount of natural light in the building, even turning the lights off when no one is on the floor. Innovations continue outdoors as well. Rainwater from the warehouse roof is collected and stored underground for irrigation, while water in the parking lots is filtered before being sent to the public sewer system. In addition, over 8,000 plants and shrubs were planted on the grounds. Honda’s environmental policies are an important part of business. Associates receive training about Honda’s environmental policy and are encouraged to assist in meeting the company’s responsibilities. Management participates in establishing goals and procedures to support the policy. The organization continually works to reduce process emissions by sourcing new material, methods and equipment to support this goal. While conserving, reducing, using and recycling within the organization, Honda also encourages suppliers to protect the environment. Finally, the organization works with government and non-government organizations to develop standards, regulations and programs to support the environment.